There seems to be a new wonder fruit found almost every week that helps extend your life. The problem now is keeping up with all the claims and even knowing what some of the fruits are and how to find them. One thing is certain – the search is definitely good for scientists in France. Not only does it keep them busy, but it probably means they have to endlessly travel the world like 18th Century explorers rooting up ever rarer and more exotic species to bring home and test them —- on pigs or people. Chokeberry – It’s American and supposedly the ‘healthiest berry in the world’ providing you don’t die trying to swollow it. Blended with apples, grapes, blueberries and strawberries, they tested it first on pig arteries – it does not say whether the pigs were alive at the time nor how they assessed the results afterwards. Maybe the scientists could tell from the grumbling grunts or the smiley squeals. 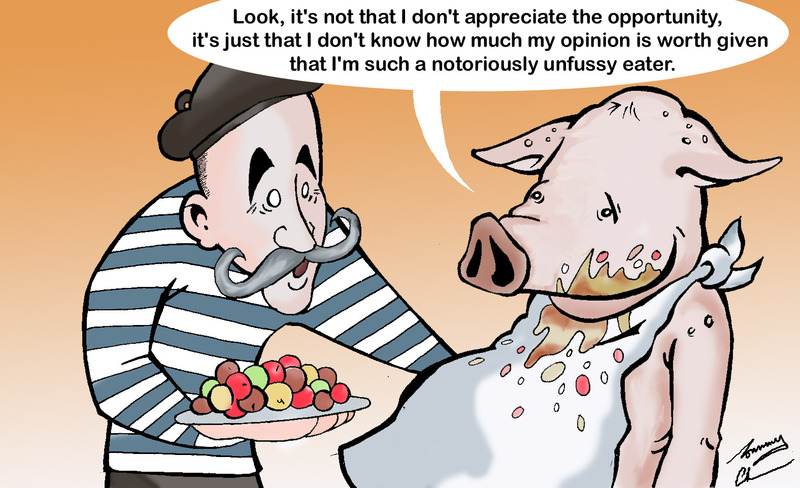 Evidently the feedback from the pigs was not conclusive even though the French have great regard for pigs’ ability to search out some of the finest and most expensive foods. No truffles found in this fruit cocktail sadly, just cowberries, acerolas and chokeberries – from the outset it doesn’t sound like a winning combination of ingredients, does it! The next step with 80 French volunteers in an “I am a celebrity, get me out of here” bush tucker trial, was to test the recipe on humans – I don’t think that Ant and Dec were recruited to assess the results but the trials were apparently a success. – Heart artery walls relaxed potentially leading to boosted blood flow to the heart. This entry was posted in HEALTH, SMILES and tagged "Fruitful Research", research. Bookmark the permalink. Oh dear it is all a giggle!